Warning: My thoughts below cannot do the book justice. I apologize. Simply put, read this book. 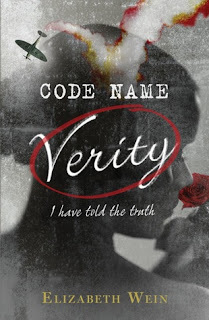 'Young adult' is not a genre I would normally reach out to read.. but I saw Code Name Verity on several bloggers' sites and I had to see what the hype was. Some were really over the moon loving this one, so it was serendipity that NetGalley sent out a promo and said to download it now, and I did. I loved the tone of the novel in spite of the evil atmosphere of the Gestapo interrogating young ladies.. this young lady for the first half of the novel we'll call Queenie.. she is indeed of royal descent and is seemingly royally capable of doing covert operations during World War II, until she is captured. The story begins with Queenie dictating everything she knows to her captors, who want all the secrets she can give regarding her British operations. She is a tough girl, though we can't really tell how old she is. Her voice is what you see in the synopsis: it is captivating, sad, haunting and yet still witty. She could make you cry and laugh in the same sentence. She writes of her comrade, Maddie, who is an awesome pilot despite being female and halfway through the book we switch to Maddie's story. And she spews her hatred of her captors that we have no choice but to hate them, too. It was really well done, with how everything going on around Queenie was impressed upon. And hovering throughout is the knowledge she is either going to be shot, burned alive or sent to some Nazi camp.. and it is just a silent torture that you keep reading and loving this story and loving these girls and knowing that this is not going to have a happy ending.. how could it?! You just want to curse out Engel and von Linden and his lackeys with the torture cigarettes... one of my thoughts while reading this was 'Sort of funny in a creepy sadistic kind of way'.. because of the brave voice of Queenie as she writes out this confession of sorts, as she knows with each word she prolongs her ultimate demise... yet she doesn't really want to give information to the enemy. And there I go, giving off too much information myself. I must stop. Bring on Maddie's voice for the second half of the book. I already knew her because Queenie told us how she was the Ultimate FlyGirl. But what happened to her after they crashed? We know Queenie was captured. Did Maddie go down in a comet of flames? Did Maddie know that Queenie was captured by the Nazis and could she get her Secret Allied friends to save Queenie? So many options. And I am not about spoil it. I can say that at this point I was on the edge of my seat, with an anxious stomach as I awaited the fate of these Awesome Gestapo Hating Fly Girls. My adrenaline pumped for them till I couldn't stand it and I wanted to cry. And then I did cry. I want to say something provocative like this is the sh*t, gosh darn it... but intelligent words fail me. I feel completely ravaged after this adventure. Something like 'f-ing Gestapo' went through my head a zillion times and that is the prevalent thought in my brain. And I loved the French phrases that were scattered throughout. "Vite! Vite!" Quickly! Utterly gripping story that I could not stop thinking about. Completely imaginative and creative way the author chose to portray this story, absolutely brilliant. Author's note explains inaccuracies, and I say brava! to this great story. Kudos to Disney-Hyperion for recognizing this gem and reissuing it. As soon as I can get my heart and stomach back in their right places, I'm buying this and re-reading it. Though Amazon Best Teen Books of the Month, May 2012: I think I'll wait till my daughter is about sixteen to share this gem.